MJV - Black White Trio Diamond Wedding Band Shine on your wedding day and everyday thereafter with this dazzling Black and White Trio Diamond Wedding Band. A monochrome masterpiece for modern brides and grooms, it is available as a ceramic ring, tungsten ring or cobalt ring, and it is offered a variety of black and white diamonds to complement your unique sense of style. The two-tone inlay comes in 10kt, 14kt and 18kt options, and the inside of the ring can be personalised with our engraving service. 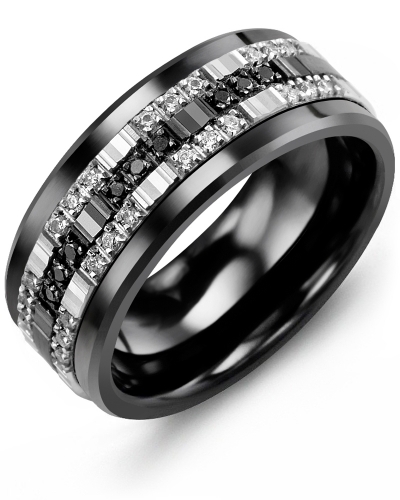 Shine on your wedding day and everyday thereafter with this dazzling Black and White Trio Diamond Wedding Band. A monochrome masterpiece for modern brides and grooms, it is available as a ceramic ring, tungsten ring or cobalt ring, and it is offered a variety of black and white diamonds to complement your unique sense of style. The two-tone inlay comes in 10kt, 14kt and 18kt options, and the inside of the ring can be personalised with our engraving service. Customer service was excellent throughout the entire process. My husband loves his ring! The ring has a great weight and looks amazing. We are both very pleased. Thank you! Greatest customer service. Quickest response rate through emails. The ring and sizers came very quick and made sure my engraving was correct.